I'm a little late to the game but I recently came across Jenna and Anne's monthly link-up on what you are currently up to (they even provide the prompts!). How fun is that?! And since I normally fill you in on what I'm waiting on...I thought I would change things up occasionally and tell you what I'm currently up to! 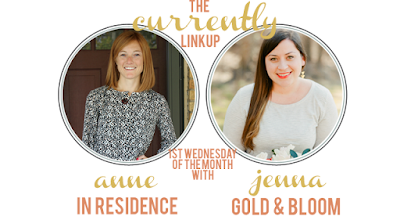 :) Check out Gold & Bloom and In Residence and link up today! This post contains affiliate links, which means that if you click on the link(s) and purchase an item, I receive a small commission. resolving: Earlier this week I shared my one little word for 2016. No resolutions, just vowing to appreciate the little things! reading: I just finished The Life-Changing Magic of Tidying Up: The Japanese Art of Decluttering and Organizing by Marie Kondo. I have heard about this book for a while but could think of so many reasons why I didn't think it applied to me. Well, let me just tell you I was SO wrong! organizing: Haha! See above! I'm organizing anything that's not nailed down! Just kidding! I'm following along with the 26 week challenge and have started with my clothes. Girls - I was astounded/shocked/embarrassed at how much stuff I have. Week by week I'll be sharing my progress. Would love to have you share this journey with me. I know I'm going to hit a point where I need some encouragement to keep going! loving: I've BEN ;) waiting since the end of last season for The Bachelor to start up again. I've watched most of the seasons but must admit, none could compare to Sean and Catherine's season. When I read Sean's post Monday before the season opener, I knew this season might just be my second favorite! craving: Now that Christmas is over, I really need winter to end. :) I definitely am craving summertime! I try really hard not to rush through seasons in my life but this Texas girl doesn't like to be cold! Hope you have a fabulous day! Gig 'em and God bless! 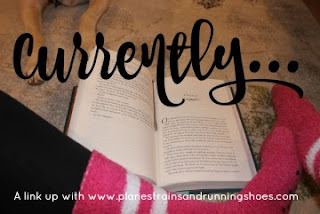 I would love to have you link up with the Waiting on...Wednesday link-up - a place where you can link up what you are waiting on, going through, making, anything - as long as it's family-friendly! :) It's open through Saturday! 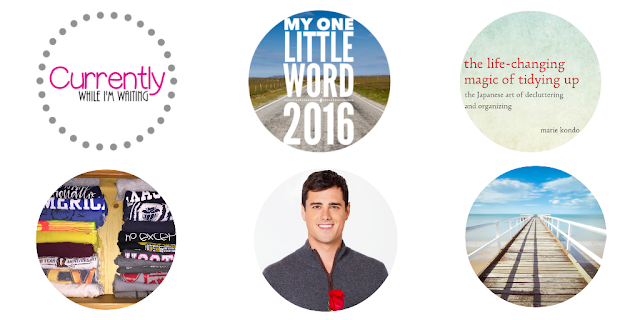 check out my FAVORITE link-ups page to see where else I'm linking up today! Okay, I know what you are doing now. Kicking off 2016 with a bang. Haha! A little bit of winter is good - I'm just ready to feel the sun on my skin! I'm so glad you found me! Hope you'll stop by again! Have a great day! I am on the decluttering train, too! I keep hearing about that book... one of these days I need to pick up a copy! So much to do but so worth it! I highly recommend the book! I have been organizing tons of stuf lately as well! I want summer time too! I am so good at keeping my kiddos stuff organized - mine...not so much! Holy heck - bringing everything out and putting in a pile was a huge eye opener!!! It's not easy but totally worth it! Good luck with your organizing!!! And, bring on summer! :) Thanks for stopping by! I love the bachelor too! Ben is SO sweet, and I can tell this is going to be an interesting season. :) Oh, and I love your word of the year! I choose on each year as well. Thanks for linking up! happy new year! Interesting is a very fair word! ;) Thanks so much for hosting the link-up! So fun to finally join you guys! See you next month! I want summer time TOOOOOO! My word for this year is BELIEVE! I BELIEVE you are going to have a great year! Power of positive thinking!!! And, yes, can summer PLEASE get her quickly?! I need warmth! Glad I could inspire you, Heather! It's definitely a marathon - not a sprint! Come back Sunday where I will share the raw before pics and hopefully some encouraging after pics! I'm loving Ben the Bachelor! Had a viewing party Monday night and we were all swooning over him. Wish you lived closer so you could join us! Me too! He's so darn cute and seems genuine! And, a viewing party?! How fun is that?! Wish I lived closer too! Love these but have never participated. Definitely we need to inspire each other to keep going with the purging/organizing!! The Currently posts have been on my radar for a while now but I usually forget about them till it's too late. They are really fun to put together! Girl, my house is BAD! But, I swear, it's changing!!! It might take a while but there WILL be a change! We can do this! Great post, Patrick! Thanks for sharing! I love the uniqueness of your "one word" of the year and message that is the driving force for your goals- I have never seen that before, and I think it is a great idea-interesting. Thank you so much! It's been fun seeing how many times the word ordinary has come up - and then finding ways to make it extra ordinary! Thanks so much for stopping by! Hope you'll visit again! I'm totally with you on craving summer time! I'd even be good with Spring! Anything but this frigidness. And I'm a huge fan of this season with Ben, too! What a sweet guy :) This is a great post idea! Thanks for joining us on the Alder Collective! Pinning, and we hope to see you again this week! Yes, please bring on Spring! Anything has got to be better than being cold all the time!!! Looking forward to Tuesdays with Ben!!! Thanks so much for hosting! I hope to be back again this week! Have a good one! I need to read the tidying up book too. I posted that this week I am challenging myself to keep my family room perfectly picked up each night. So far so good. It is a must read!!! I'm LOVING it! My closet looks better than, well, EVER! I actually want to go in there now! ;) Great job on the family room pick-up each day! That's not an easy thing to do!!! Keep up the great work! We can do this! Thanks for stopping by! Hope you'll stop by again! Great post centered around some pretty intense action verbs! Haha! Thankfully the hosts share them with us each month! ;) Thanks so much for stopping by! Hope you have a great week! Thanks, Kelsie! Ben IS such a cutie! Great Blog post its cold here.... Just saw your words 2016 " No Resolution" works for me! Yep - I would have probably already broken any resolutions had I made any! :) I'm glad you stopped by! Have a great day! I love The Bachelor and I am definitely loving Ben as well! I didn't get my Currently post up in time last week, but glad to see you made it to the party. I did some decluttering recently and loved it. Keep up the good work. I've only watched 1/2 of the first episode but I have it DVRed. I'm silly - I only want to watch it when I can sit uninterrupted for the entire show! :) Thanks for your encouragement - much appreciated! Hope you are having a great evening! Thanks for linking up and sharing the love! I haven't read The Life Changing Magic...but I just ordered her newest book! I've heard that it expands on what she wrote in the first one so we'll see if I decide to go back and read that one but I definitely need some more organization in my home life! I love your word for 2016! Mine is Growth. I've downloaded her newest book - I'm hoping to read it this weekend! You'll have to let me know what you think! Thanks so much for hosting! I hope to be back again next week! Have a great weekend!